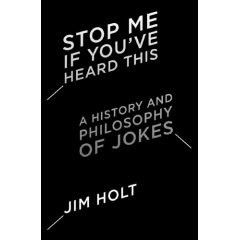 As reported in Wired, science writer Jim Holt explores why we laugh in his book Stop Me If You've Heard This: A History and Philosophy of Jokes . Talking of which Shedman had his piles banded yesterday for the second time in a decade, and he wouldn't want to enjoy the procedure more often than that thanks. Sitting in damp sheds can't be doing him any good at all. Shedman took a taxi home. The driver decided that the quickest route from the hospital to Shedman's home negotiated every speed bump in Brighton. Thank you so much Brighton Streamline. Isn't something streamlined smooth, fluid and relatively pain-free? 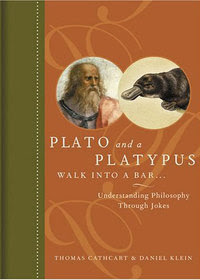 Another book about philosophy and humour is the very amusing and informative Plato and a Platypus Walk Into a Bar . . .: Understanding Philosophy Through Jokes by Thomas Cathcart and Daniel Klein.